TECHNONICOL XPS 35 300 CARBON FACADE is an up–to–date heat-insulating material widely used in building and construction while arranging heat protection of the basement, roofs, floors, facades, heat insulation of railways and highways. 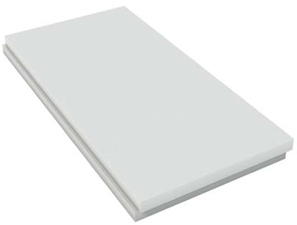 TECHNONICOL XPS 35 300 CARBON FACADE extruded foamed polystyrene is a heat insulation material with uniformly distributed closed cells which does not absorb water, doesn’t swell and shrink, is chemical–resistant and is not subject to rotting. High resistance allows to receive equal and simultaneously rigid base, and it essentially increases term of operation of the whole heat–insulating system. TECHNONICOL XPS 35 300 CARBON FACADE slabs should be stored sorted by brands and dimensions, in a dry closed place, horizontally in piles at a distance of not less than 1 m from heaters. Slabs on pallets or linings should be stored under an awning, protecting them against atmospheric precipitation and sunlight.